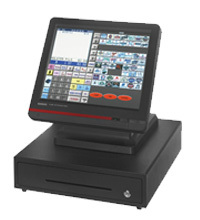 The QT-6600 flash ROM touch POS terminal offers flexible connectivity, stable system integrity, easy operation, speed and efficiency for your hospitality or retail needs. The 15" touch screen and a built-in 2-line alpha/numeric customer display encompassed in a solidly built cabinet design generating the impression of a high end PC/POS terminal but without inherent hard drive and operating system problems. 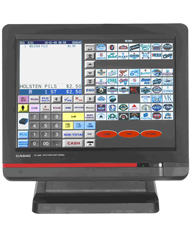 The QT-6600's built-in software is designed with fast food, table service, cafeteria and retail scanning in mind. A variety of operational features are available that include floating guest checks, sharing printers, time & attendance, mix & match discounting, a large scanning file, time and date activated operations (price shifting or automated reporting), graphical split check and integrated credit/debit gift card functionality to name a few. The QT-6600 offer many features found in PC based by at a significantly lower price such as he 10/100 Base-T Ethernet port that provides fast reliable communications between machines, PC and/or high speed Internet connection. There are six (6) serial ports providing customers flexibility in peripheral connectivity to accommodate demanding operations. Remote locations can communicate back to a central office using an Internet to poll report data or send program data to stores. The built-in FTP functionality provides a quick simple method to obtain store level sales information through the QT-6600 scheduler function by a time/day or date sensitive file which will send automatically to a central PC. Graphical icons can be assigned to keys providing operators an easy way to identify items. A large scanning file with the ability to scan price encoded bar codes, interface to scales, age verification functionality, food stamps, a customer charge file and EBT interface add up to a well rounded retail terminal. In addition to all these features extensive reporting is available to provide management extensive information.